I know most of you are done with Christmas and so ready to move on to what’s on the docket next (which is too bad, because I still have a lot of Christmas to report). But before putting all of those Holiday Decorations back in storage until Thanksgiving, you may want to make another trip to check out the deals. Most stores have now marked Christmas stuff down to 75% or even 90% off. It helps if you know what you are looking for. I have told you that I have themes for each Christmas. Is this necessary? Probably not for most people, but I can be a horrible decision maker, and having a theme (for just about everything), makes decisions much easier to make. It is the barometer by which to judge purchases and ideas. This year, my theme was “A Partridge in a Pear Tree” utilizing a lot of pear green. (Still need to report on that). I’ve already settled on next year’s theme. It came from the decision to travel to Utah to spend Christmas with my parents this year. We had a wonderful time (the kids got to go sledding and build snow forts), but I am really looking forward to having Christmas in my own home, next year and hopefully eliminating some of the stress that comes from traveling in the middle of Christmas preparations. So my focus is on HOME! I am calling the theme “Home for the Holidays” and it will be about all things “homey.” The color scheme will be red and cream and brown. We will make a gingerbread house and decorate my family room (where the gingerbread people stockings are) in a kid-friendly, rustic, homey sort of way. 1. I found this garland at Target (Smith & Hawken). I got it at 50% off (they were selling out so didn’t go any cheaper). I’ve bought four of them, because I am trying to cover my whole banister. So I bought all four that I could find, and a couple of other less expensive Target garlands with a similar feel. I love how the S&H one looks really real! 2. I held out on these reindeer pillows until they hit 75% off (Target.) They are perfect for my “homey” theme next year–soft and cozy. 3. (Target–again) I’ve decided to do a smaller tree in the family room. I’m thinking popcorn and cranberry garland, paper chains, and lots of homemade ornaments. I hope this one looks alright, because it was a steal at just over $6 for a 6 foot tree!!! 4. Oh, I grabbed some parchment paper at Target, because it was 50% off, and I can use it all year long, even though there are pictures of Christmas goodies on the box. I’m also thinking of buying some more almond bark (melting chocolate and white chocolate) because I know I was looking for it last year, and none of the stores had it since it wasn’t holiday candy-making season. Anyone know how long that stuff stores? 5. I finally found these Martha Stewart gingerbread house boxes at 50% off at Walmart (3rd Walmart I looked at). Remember my theme? I’m thinking of baking gingerbread people and giving them to neighbors in these cool boxes. 6. And while looking at Martha Stewart stuff at Walmart, I decided to pick up this beautiful glitter and stamp set (featuring gingerbread houses etc.) at 50% off. I’m sure I will need them for some project. 7. I’ve already used these candlesticks from Target for New Years, and I think they will work well year-round. A few years ago, I found my 3-tiered serving tray for a couple of dollars on an after-Christmas clearance at Target. 9. 75% off gift tags from Target. Some fancy styles. Fun to have around, if you don’t have to spend much money on them. 10. Battery powered LED lights at 75% off from Target. Would like to find more of these. 11. Letter to Santa ornament from Target for the new tree. This is in case we still can’t find our special Santa mailbox next year. 12. Wrapping paper that’s perfect for next year’s theme/design scheme at 75%off at Target. Oh, and I just noticed that down below the gift tags–mostly off-screen, are some Christmas thank-you notes, I got at 75% off, because we are try to still remember to be grateful, so hopefully, tomorrow for Family Home Evening, we will sit down and scrawl out a few notes to grandparents, etc. I haven’t taken down Christmas yet, because the kids aren’t ready, and I’m not sure I’m done with my bargain shopping. Anyone know if there is anything good left at Hobby Lobby? I found some great stuff there at 90% off after Halloween! 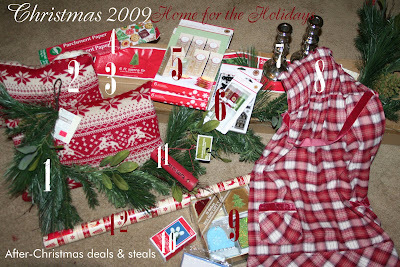 Anyone else have Christmas 2009 some-what planned, already? I love Target and the 90% off sale! I got a 7 foot tree for $5. I also stocked up on some prizes for my annual gift/cookie exchange party. I only wish I was as organized as you! Nice job working the 90% off sales! I may have to make another round or two! Don’t you just LOVE Target!! That is one store I can’t live without. Good finds!